What is the magic angle? This equation shows the expected dependence on the strength of the dipole (μ) and inversely with the third power of distance (1/r³). What may be a little surprising is the angular dependence given by the term (3 cos²θ − 1). It is fairly easy to see from the diagram above that the z-component of the dipolar field (Bμz) would be maximally positive directly in front of the dipole and maximally negative immediately to either side. Somewhere between these positive and negative "lobes" Bμz must pass through zero. This occurs at angles θm where (3 cos²θm − 1) = 0. These θm values are known as the magic angles. They occur at approximately 54.7°, 125.3° (=180°−54.7°), and so forth around the circle. When two nuclei interact through a dipole-dipole mechanism, the z-component of the dipolar field from one nucleus alters the local field experienced by the second nucleus. In other words, Bμz adds or subtracts to the Bo field experienced by the other nucleus, causing it to precess slightly faster or slower than it otherwise would. As a result, the second nucleus gains or loses phase and undergoes T2 relaxation. This effect is particularly strong when molecular motion is slow and the Bμz field is relatively static. Dipolar interaction as a function of angle between spins. In a clinical MRI context this can be viewed as 1/T2 vs tendon orientation relative to Bo. When the arrangement of the two nuclei approach the magic angle, the effect of Bμz is minimized and the T2 value is increased. As shown in the graph (left), this angular dependence changes gradually over a wide range of angles rather than dropping off precipitously at the magic angle. The dipolar interaction does not return to normal at 90° because of the combined effects of the "dips" at 54.7° and 125.3°. The magic angle effect is important in the clinical MR imaging of certain tissues that are highly structured and are oriented obliquely to the main magnetic field (especially tendons, cartilage, and peripheral nerves). The MR signal may spuriously increase near the magic angle mimicking pathology. Due to their dense molecular structure and strong static dipolar interactions, tendons possess short intrinsic T2 values (1-10 ms). The signal of tendons is uniformly low on all conventional MR sequences due to this rapid T2 decay. When oriented at the magic angle, however, the T2 of tendons rises to about 20 ms with a corresponding increase in their signal intensity. Although the magic angle phenomenon affects T2 relaxation (not T1), the increase in signal intensity of tendons will only be appreciated if TE is kept reasonably short. When TE exceeds 40 ms the tendon signal will again be so low that the T2 prolongation will not be recognized. Paradoxically, therefore, the magic angle phenomenon in tendons will be most noticeable on T1- and proton-density-weighted images (using short of medium TE's) than on heavily T2-weighted sequences (with long TE's). A basic science application of this phenomenon is known as Magic angle spinning (MAS), a technique used in solid-state MR spectroscopy laboratories. 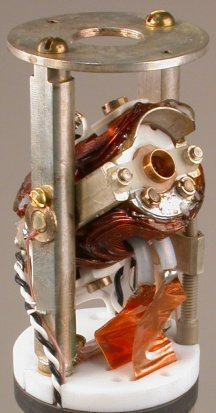 The sample is placed in an air-turbine device angled 54.7° with respect to the main magnetic field and spun at rates up to 70 kHz. The angulation and spinning averages out the dipole-dipole couplings to zero allowing better appreciation of features of the NMR spectrum (such as secondary quadripolar couplings and chemical shift anisotropies) for determining molecular structures. Although mostly reported in regard to tendons, the magic angle phenomenon can also be seen in peripheral nerves that contain longitudinally-oriented type I collagen fibers in the epineurium. Nerves, however, possess several imaging differences compared to tendons. First, the magic angle effects of T2 prolongation in peripheral nerves can be appreciated on STIR or T2-weighted SE sequences (even with TE's longer than 60 ms). Secondly, the change in signal may occur more gradually and over a wider range of orientations in peripheral nerves compared to tendons. This different imaging behavior likely relates to the fact that the peripheral nerves contain substantial material besides collagen and with average baseline T2 values higher than tendons. Finally, it should be noted that the magic angle effects will occur in a different location and plane of imaging if MRI is performed in a vertical bore scanner (having a different orientation of Bo with respect to the regional anatomy). Bydder M, Rahal A, Fullerton GD, Bydder GM. The magic angle effect: a source of artifact, determinant of image contrast, and technique for imaging. J Magn Reson Imaging 2007;25:290-300. Chappell KE, Robson MD, Stonebridge-Foster A, et al. Magic angle effects in MR neurography. AJNR 2004;25:431-440. Erickson SJ, Prost RW, Timins ME. The "magic angle" effect: background physics and clinical relevance. Radiology 1993;188:23-25. Fullerton GD, Rahal A. Collagen structure: the molecular source of the tendon magic angle effect. J Mag Reson Imaging 2007;25:345-361. Jiang YJ, Harper JK. An explanation of magic angle spinning NMR experiments in the time domain. Concepts Magn Reson Part A, 2009; 34A:249-263. Peh WCG, Chan JHM. The magic angle phenomenon in tendons: effect of varying the MR echo time. Br J Radiol 1998; 71:31-36. Physicsinsights.org. The field of a small magnetic dipole. 2007. (A short and straightforward derivation of the Bμz equation given above). Can you explain a little more about the dipole-dipole interaction? I still don't quite understand. Why is T1 longer than T2?